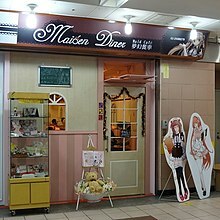 Maid cafés (メイド喫茶 / メイドカフェ, Meido kissa / Meido kafe) are a subcategory of cosplay restaurants found predominantly in Japan. In these cafés, waitresses dressed in maid costumes act as servants, and treat customers as masters (and mistresses) in a private home, rather than as café patrons. 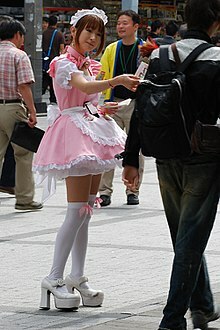 The first permanent maid café, Cure Maid Café, was established in Akihabara, Tokyo, Japan, in March 2001, but maid cafés are becoming increasingly popular. As they have done so, the increased competition has made use of some unusual tactics in order to attract customers. They have also expanded overseas to countries like China, South Korea, Taiwan, Thailand, Australia, Hungary, the Czech Republic, France, the Netherlands, Mexico, Canada, Brazil, and the United States. Maid cafés were originally designed primarily to cater to the fantasies of male otaku, fans of anime, manga, and video games. They have been analogized as the otaku's equivalent of hostess bars. The image of the maid is one that has been popularized and fetishized in many manga and anime series, as well as in gal games. Important to the otaku attraction to maid cafés is the Japanese concept of moe, which is a character trope in otaku media which describes young, innocent-looking female characters. People who have moe fetishes (especially a specific subcategory known as maid moe) are therefore attracted to an establishment in which they can interact with real-life manifestations (both physically and in demeanor) of the fictional maid characters that they have fetishized. Cafés may also employ a tsundere theme - another character trope which is a subset of the moe phenomenon and refers to a character who is initially cold or hostile before revealing feelings of warmth or affection. Around the early 2000’s, maid cafés became more common and popular in Japan as otaku culture became increasingly mainstream. As a result, there has been a diversification of themes and services at the restaurants but they are ultimately still predominantly colored by anime and video games. Today, the maid café phenomenon attracts more than just male otaku, but also couples, tourists, and women. Most maid cafés offer menus similar to those of more typical cafés. Customers can order coffee, other beverages, and a wide variety of entrées and desserts. However, in maid cafés, waitresses will often decorate a customer’s order with cute designs at his or her table. Syrup can be used to decorate desserts, and omelette rice (オムライス, Omu-raisu), a popular entrée, is typically decorated using ketchup. This service adds to the image of the waitress as an innocent but pampering maid. There are many rituals and additional services offered at many maid cafés. Maids greet customers with "Welcome home, Master (Mistress, My lady)" (お帰りなさいませ、ご主人様(お嬢様)！, Okairinasaimase, goshujinsama (ojousama)) and offer them wipe towels and menus. Maids will also kneel by the table to stir cream and sugar into a customer's coffee, and some cafés even offer spoon-feeding services to customers. Increasingly, maid cafés offer grooming services, such as ear cleanings and leg, arm, and back massages (provided the customer remains fully clothed), for an additional fee. Customers can also sometimes play rock-paper-scissors, card games, board games, and video games with maids as well as prepare arts and crafts and sing karaoke. Customers are also expected to follow basic rules when they are at a maid café. One Tokyo maid café recently published a list of ten rules that customers should follow in a maid café. For example, customers should not touch a maid's body, ask for a maid's personal contact information, or otherwise invade her personal privacy (by stalking). One common rule in a maid café is that photographs of maids or the café interior are forbidden. However, customers may have the option of paying an extra fee in order to get his or her photograph taken with a maid, possibly hand-decorated by the maid. ^ "Intersections: Maid in Japan: An Ethnographic Account of Alternative Intimacy". Intersections.anu.edu.au. February 25, 2011. Retrieved 2014-01-22. ^ "Maid Cafés – The Expanding Industry in Japan". uniorb.com. June 15, 2006. Archived from the original on February 22, 2016. Retrieved 2018-07-17. ^ Galbraith, Patrick (2009-11-13). 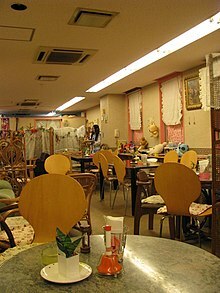 "Best Tokyo maid cafés". CNNGo. Archived from the original on July 4, 2017. Retrieved 2009-11-17. ^ "Cosplay dinner attracts China's anime fans". China Daily. 2012-02-06. Retrieved 2012-02-06. ^ Tomu (2014-09-10). "Maid for Dummies". Otakumind. Archived from the original on March 19, 2016. Retrieved 2014-03-17. ^ a b c d Galbraith, Patrick W. (October 31, 2009). "Moe: Exploring Virtual Potential in Post-Millennial Japan". Electronic Journal of Contemporary Japanese Studies. Retrieved July 10, 2015. ^ "Tokyo's cross-dressing maid cafe". Reuters. 2008-04-14. Retrieved 2012-01-23. ^ a b c Ashcraft, Brian (February 4, 2011). "Hang Out In Nerd Paradise (With Maids!)". Kotaku. Gawker Media. Retrieved 10 July 2015. ^ a b c Mounteer, Jordan (May 30, 2014). "What it's like inside a Japanese maid cafe". Matador Network. Retrieved 10 July 2015. ^ "Maid Cafés In Japan". Curiosite. Retrieved 2009-11-17. ^ a b "Maid Cafe Code of Conduct Chastises Creepy Clients". InventorSpot. Retrieved 2014-05-24. Hoffman, Ken. "A haircut and more at Maid Café". Houston Chronicle. December 5, 2011. Shigeto Kawahara. "The phonetics of Japanese maid voice I: A preliminary study" (PDF). This page was last edited on 5 February 2019, at 15:24 (UTC).